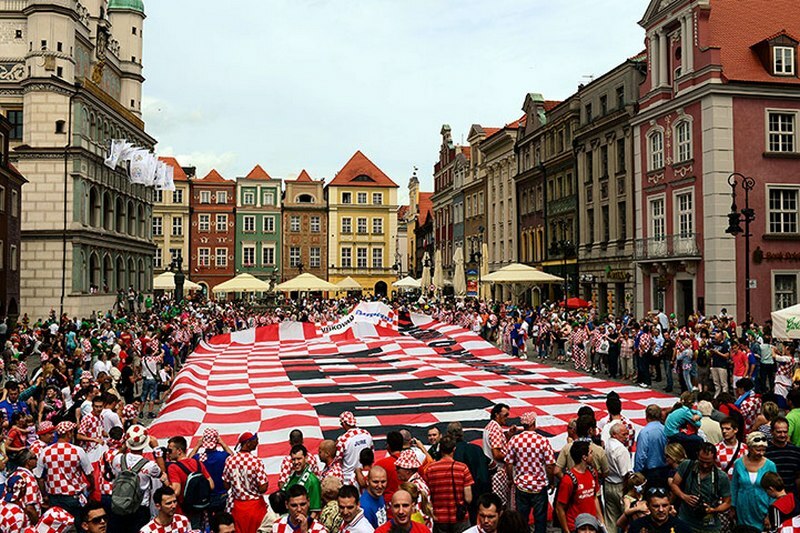 Croatia: Pletikosa, Srna, Corluka, Schildenfeld, Strinic, Vukojevic, Rakitic, Modric, Perisic, Mandzukic, Jelavic. Croatia substitutes: Kelava, Simunic, Buljat, Pranjic, Badelj, Vrsaljko, Dujmovic, Kalinic, Kranjcar, Vida, Eduardo, Subasic. 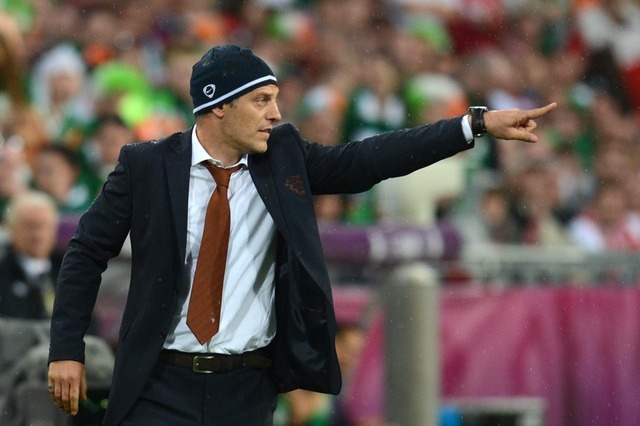 Ireland: Given, O'Shea, St. Ledger, Dunne, Ward, McGeady, Whelan, Andrews, Duff, Doyle, Keane. Ireland substitutes: Westwood, Kelly, McShane, Walters, Gibson, Hunt, O'Dea, Long, Cox, Green, McClean, Forde. This is the first time Ireland have qualified for the European Championship since 1988. 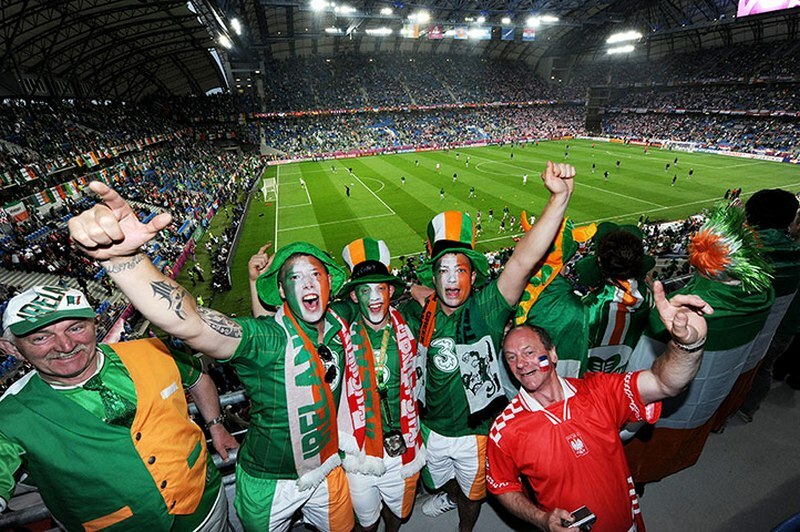 Irish fans, and one of them with Croatian jersey among them on the right. 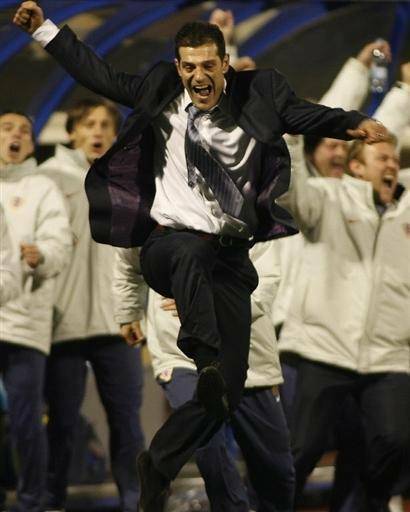 Slaven Bilić celebrating a victory. 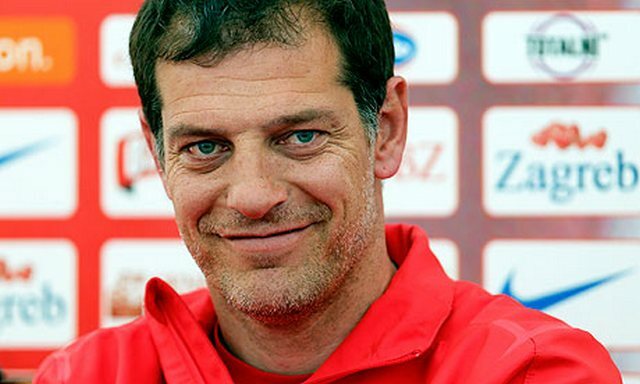 Thank You, Slaven! 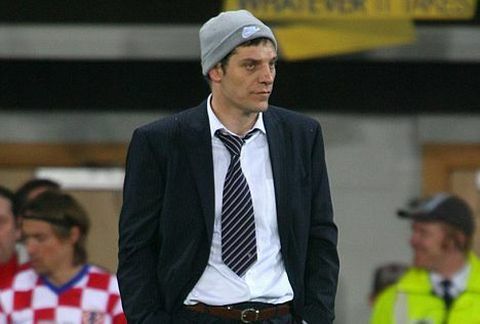 Slaven Bilić, Croatia's coach. Except in Croatian, he is fluent in English, German and Italian. He will soon add Russian to this list. 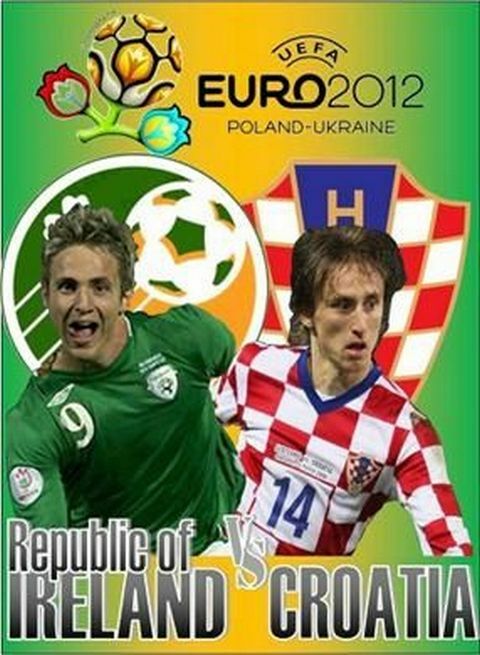 Croatia start their Euro 2012 campaign against Ireland on Sunday, 10 June, with Slaven Bilic preparing for his last tournament as an international coach before joining Lokomotiv Moscow. Here the charismatic former West Ham United and Everton player talks openly and at length about his coaching philosophy, his hopes for the summer and England's biggest problem. Q. You have said that Croatia could go "all the way" if some things click for you. Do you really mean that? Slaven Bilić. You can call me a madman, but I think I'm just being realistic. There are teams that are stronger than us on paper, as well as those who are weaker, again on paper. For the last five years, we have been either among the top 10 teams in the world according to the Fifa rankings or very close to that. And those rankings are realistic, because they take results into account, not natural beauty or shirt design. If we stay clear of injuries and prepare properly, which I'm sure we will, than we have a chance against anyone. There are only five matches on the road to the final – if we take each one as it comes, with a right plan and motivation we really could go all the way. In 2008 we were only one minute away from the semi-final, and if we got through [the group] we would have a big chance to win the tournament. I'm saying that because I know the character of this team – when we take off, it's an explosion. Q. How important for you is the fact that, for the first time in four years, you now have enough time to prepare? Slaven Bilić. It's the greatest blessing we could possibly have. Croatia is a small country and has a very limited pool of players, and almost all of them play abroad. During the qualifiers we only had a few days together before each game, so sometimes we had to look for temporary solutions and improvisations. But now, finally, we have enough time to solve the problems we have – maybe we can't completely eradicate them, but we will do everything in our power to minimise their impact on our play, as well as maximise our strengths. Besides, we have a very positive common experience of preparations and tournament from four years ago, so that calls for optimism, too. These players love being together. Q. It seems that, as a strategist, you put emphasis on individual instructions rather than specific formations. Do you agree? Slaven Bilić. My opinion is that formations are slowly dying out and a large number of experts will confirm that. It has become increasingly difficult to mark the movement of the players, with regards to the ball, just by assigning numbers to each line. Fluidity is much more important – you want your team to stay compact, and your lines to remain close to one another, so they can flow over. You need to make sure that no gaps emerge, and that tends to happen often to teams who play with strict lines. A quality opponent will always find your weak spot and massacre you. But that doesn't mean the system is any less important. Organisation and automatism are the foundations for everything – only if you have that, will the individual quality of your players show in a positive way. I will never underestimate the value of individualism and inspiration – but without a solid system, improvisation is just anarchy. And anarchy can also sometimes bring you a result, sometimes even better than your established schemes, but it cannot be a long-term solution. Q. Croatia always had strong individuals. How much was your tactical outlook influenced by the fact that you were part of the team that finished third at the 1998 World Cup, and played with three playmakers – Boban, Prosinecki and Asanovic? Slaven Bilić. A lot, because that's when I realised what kind of football is best suited for the Croatian character. We have strong individuals now, too. My intention wasn't to build a system around them, but I didn't want to fit them into a system either. I simply try to give each of them a mandatory frame in which their lucidity will hopefully flourish. Q. You're known for being one of few managers, especially in the international football, who use five, sometimes even six offensive-minded players in the team at the same time. Does that reflect your desire to play attacking football or simply a necessity, because Croatia has much more options up front than at the back? It's pure pragmatism. Of course I prefer a passing, possession-based attacking game more than destructive, defensive play, but you have to look at what's best for the team with regards to the players at your disposition. When I took this job, my assistants and I analysed our pool of players and realised we're much better covered in attacking positions. We concluded that our chances against the stronger teams will be better if we try to build our play with more offensive players. If we decided to go the other way, we just wouldn't be as good and the players would be unhappy. But even though we use many offensive-minded players, solid defence is the foundation of our play. You can never score as many goals as you can concede if your defence is porous. You know, for a long time the people have been saying that strikers are the first line of defence, but that was just a phrase intended to motivate the team. However, today the strikers have the obligation to fulfil their defensive assignments, and that especially goes to my boys. We're more dangerous when we play with two strikers, but then those two really have to work hard defensively – just like Olic and Mandzukic did in the qualification play-offs against Turkey. Slaven Bilić. I don't think we need to adapt our play to Jelavic – not more than to any other player in the team, anyway. He's fantastic, a modern version of the classic 'No9' who needs very little space to convert a chance. Playing like he does is the hardest thing for a striker today. People ask how is it possible that he can score twice against Manchester United, but not once against Georgia in the qualifiers, and blame that on our system. Well, it's because against United he can use his skills to find the space between three world-class opposing players in the box – he's that good. But Georgia had eight players in the box whenever we tried to attack and no system would make it easier for a striker in those circumstances. Besides, I think Jelavic will get more useful balls from our players than he receives at Everton. There he works very well with Tony Hibbert, who was a youth player when I played for the Toffees and I'm really glad he has had such an accomplished career with the club. But I hope I won't offend Hibbie if I say that Darijo Srna crosses the ball better and more often than he does. I also have to say that Jelavic's contribution cannot be measured by goals alone. The opponents know just how dangerous he can be and have to work hard to cover him, which enables us to move our line to 20 metres from their goal and press them. Q. You follow global trends in football and you have proved to be flexible when it comes to formations. How likely is it that you will prepare some kind of tactical surprise at the Euros? Slaven Bilić. It is possible, although our style of play is more or less known. Maybe we won't go so far and play with three in the back line, although we have tried that before in certain phases of our matches. But football has changed so much in the last few years and it's extremely important to keep pace with that development. Especially now, when we have enough time to prepare. Q. What has changed the most in your opinion? Slaven Bilić. It used to be quite a different game tactically – think those Chelsea v Liverpool clashes in the Champions League, those were chess games between Mourinho and Benítez. The goal justified the means. But then Pep Guardiola was crucial in changing that with his Barcelona team, so I have nothing but respect for him. He initiated a revolution in the way coaches look at football. It's true that Barcelona played attractive, attacking football before, and that tiki-taka comes from Cruyff and Rexach, but never before they played the way they did under Guardiola. And that has had a profound influence on other coaches, because everyone wants to emulate the best: most teams today try to play football, they strive to creation, not destruction. Even the Italians took part in that – both the national team and their clubs, with the exception of Inter and a few minor clubs in Serie A. That was unheard of before Guardiola. Now almost everyone realises that apart from getting a result, it's very important how you play. The fans will accept almost anything as long as there's success, but in the long run, people want to be entertained, they want to enjoy themselves at matches and this is why football needs to be attractive and fun. At Croatia, we have always tried to play and we always look better when our opponents play positive football. Because of the way we play, it's much easier for us when the game is a two-way street. Slaven Bilić. 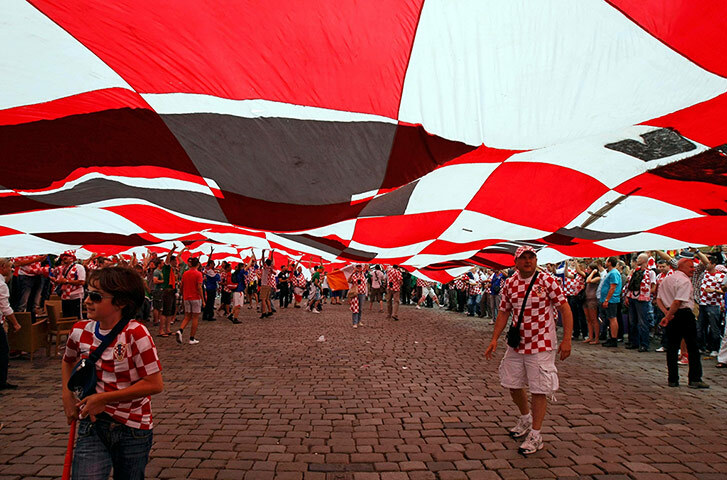 The overall atmosphere around football in Croatia is not good, with the turmoil in the FA and numerous scandals in the national league, but that's not necessarily a disadvantage. The Italians had a similar situation in 2006, and they won the World Cup. A lot of negative energy was directed at us through the media – the critics were sometimes well-deserved, and sometimes completely unfounded. But that has only brought us closer together, and I nevertheless expect full support from the fans come the Euro. Q. How crucial is that Luka Modric is at his best? Slaven Bilić. All players have to give top performances if we want success, but obviously everyone expects the most from Luka. He dictates our play and makes others better with his rhythm and passes. He does the same at Spurs – if he plays well, the team plays well. Luka knows just how crucial his performances are going to be and he's ready to handle the pressure. Q. We all know who the favourites are, but which team do you think could surprise everyone at the Euros? Slaven Bilić. Any of the 16. Some will need more luck than others, but any team can be a surprise package. Take Poland, for example – they're hosts, they can compete with all three teams in their group and they will be hard to stop if they get going. The same goes for Ukraine. I wouldn't dare betting against the really well-organised Sweden, either – if their strikers are in top form, I don't think anyone can count on beating them. Q. What do you think of England's chances? Slaven Bilić. There's definitely some 'meat' in that team and they could go far. I don't agree with those who say their problem is that players get exhausted after a long season, but something hasn't been right with England for a long time now. They talk of unity, the Three Lions and all that stuff, but they have huge problems with personal relationships within the team. If they didn't, they would surely have had some international success because they're too good to keep underachieving all the time. But England could do 'a Chelsea' at this tournament: they've changed their manager and people may not expect much of them anymore, but it's the last shot at something big for several of their players. They should draw on that for motivation. Q. You play your first game against Ireland. What kind of match do you expect? Slaven Bilić. It will be a tricky match, I can tell you that. A bloody hard match. I've studied all of their games and their defensive discipline is amazing. You dominate the play, you have the ball in possession and you attack, but they just don't give you too many chances to score. We will have to run harder than them, stay compact, fight for each rebound and be really patient. We can't afford to lose our nerve, because Ireland can easily hurt you with a single counter-attack through Duff, McGeady, Long or Keane. How you start is always key to your confidence and self-esteem and Ireland is our big chance, but I'm sure they're saying the same about us. Q. What did you learn, as a coach, from your years of playing in England? Slaven Bilić. There was one thing that impressed me the most, and that was a fantastic balance between pressure and freedom. Pressure is important for every job – a journalist will generally write a better article if he's under pressure or if he writes for a better newspaper. But the key is to channel that pressure into positive energy: you want it to be a drive, not burden. And that's what the English do best. Sometimes huge investments depend on a result of a single Premier League match, the pressure is huge, but you don't feel burdened by it in a negative way. Regardless of the press which can be really cruel – after all, the English invented that kind of journalism. In the Premier League you learn how to overcome fear and negative emotions, how not to dread what might happen but stay motivated and fight the best you can for your team. And that can often be a decisive factor when two even teams meet. Q. Who were your biggest influences as a coach and what did you learn from them? Slaven Bilić. It was never my plan to become a coach. But then my club Hajduk Split called and I had to answer, so I caught the coaching virus. Later, I stayed with two of the best managers at the time – Arsčne Wenger at Arsenal and Marcello Lippi at Juve, studying their methods and approach. They only confirmed what I always felt was right, but what stood in stark contrast with the old-school dogmas in former Yugoslavia: you don't have to be a tyrant to earn the respect of your players. The only authority you need is the authority of knowledge. 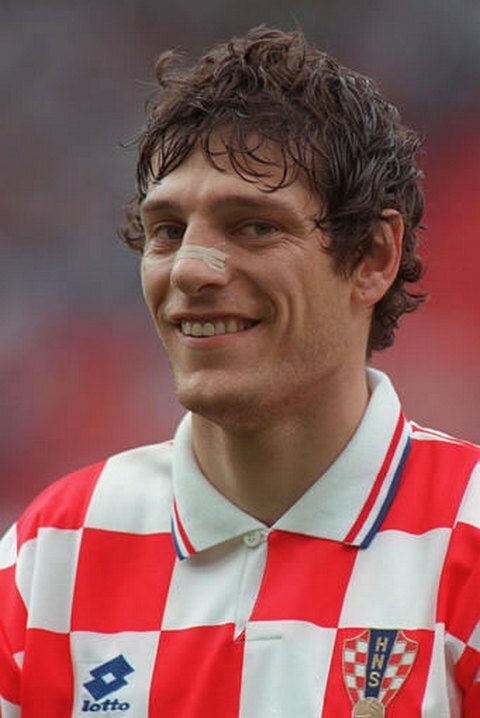 I also realised that as a player in Germany with Winfried Schäfer and in England with Harry Redknapp and Walter Smith – all great coaches, as is Miroslav Blazevic of the Croatia national team in the 1990s. Q. 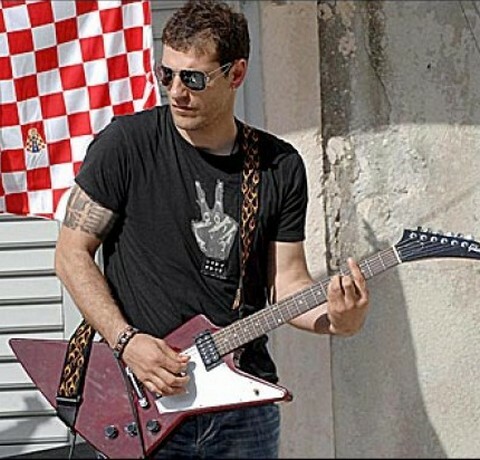 You leave your post as Croatia manager after the Euros [Bilic has agreed to coach Lokomotiv Moscow]. How will this affect the team? Slaven Bilić. Right now, I'm completely focused on the Euros and I don't think about anything else. I'm really proud of this job: to manage your country's national team is the highest point in a manager's career and I don't think any job in the future will mean this much to me, although I'm going to dedicate myself to each one of them 100%. I take great pride in my decision not to give up after the first, second or the fifth time we failed at something and they said I should go. I didn't want to go as loser. But I have always seen myself as more of a club coach. I've never concealed those ambitions and I was glad when clubs first started to express their interest four or five years ago. Q. A lot of people thought you would end up in England after the Croatia job. Do you think you still could one day? Slaven Bilić. I admit to being an Anglophile, but I had my chances to go to England. I have had offers from big clubs and chose to stay. I would love to work in England, because of the language and the unique football culture, which is different to anywhere else. But I'm not afraid of the challenge – when I [was] choosing my next job, the potential of the club was more important to me than the country and the league. Q. Are you ready to handle the everyday pressure which comes with coaching a big club? Slaven Bilić. Every job brings specific problems and demands adapting, but I don't think I'm exaggerating when I say that nothing can compare to the pressure I have experienced in six years on the job as Croatia manager. That's something else. You know, my mother is watching this. My children, too. Their neighbours, the kids at school or just about anyone they know feel it's their place to comment on the decisions I have to make.